Discovering a lost masterpiece – at last! Well, what to say? 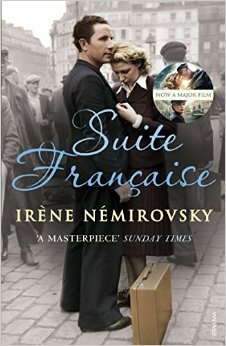 After my rediscovery of Irene Nemirovsky’s wonderful writing recently through her novellas, I figured that now was the time to have another attempt at “Suite Francaise”, the book which brought her to the attention of most modern readers. So I rescued my copy from the charity box and took it with me when I was rushing about, organising things for the Aged Parents. And it proved to be the ideal read! SF was of course never completed, as Nemirovsky was taken to Auschwitz and murdered by the Nazis. So what we are left with is two sections of a projected five-part work, the surviving ones being “Storm in June” and “Dolce”. The first tells of the fall of Paris in June 1940, following a broad cross-section of the populace as they flee the city; the second focuses on a small village after the occupation by the Germans, showing how the various people cope with the presence of the enemy in their midst. There are connections between the two parts, with certain characters featuring more in “Dolce” than others, though we still see glimpses of all. And what a range of characters they are too: including the Pericands, a large and prosperous family, running away with as many possessions as they can carry; the writer Gabriel Corte and his mistress; Charles Langelet, an aesthete whose only concern is his works of art; and the Michauds, lowly bank employees who are desperately worried about their son, who is off fighting and has gone missing. Frankly, the majority of the characters are unpleasant and it’s obvious that Nemirovsky is intent on showing the various French people, most of whom are monied, in a very unfavourable light. Only the Michauds are sympathetically portrayed as genuine, ordinary working people simply happy to be together and hoping for the return of their son. In fact, Jean-Marie Michaud is alive and being sheltered at the farm of the Sabarie family near Bussy, where the action of “Dolce” will take place. When it becomes clear that the Occupation has begun and there is no point in fleeing, many of the refugees in fact return to Paris, and we are left to follow the action in Bussy when the German forces arrive. We see much of the action through the eyes of the Angellier family, particularly Lucille (whose husband is a prisoner of war) and her rather nasty mother-in-law, with whom she doesn’t really get on. The other major events take place on the Sabarie farm where tensions are high because of the fact that a German soldier has been billeted there. Similarly, a German Commander, Bruno von Falk, is staying with the Angelliers and inevitably Lucille is attracted to him – in the main because he is an intelligent and cultured man, in contrast to her husband, and her attraction to the enemy is reflected in much of the behaviour of the village women, with much fraternisation taking place. Events come to a head on the Sabarie farm; Lucille struggles to hide her feelings from herself, her mother-in-law and Bruno; and the village people try to get on with a normal life in very extraordinary circumstances. The book ends with the troops being withdrawn to fight on the Russian front. What a remarkable work this is, and what a tragedy that Nemirovsky never came to complete it! It’s utterly compelling and full of the most thought-provoking writing. She deals with very deep matters, touching many nerves that are still sensitive amongst the French when it comes to the subject of collaboration; with astonishing clarity for someone who was actually in the middle of the conflict. I believe the book provoked strong reactions in France when it was finally published, which I can understand, as Nemirovsky doesn’t hold back any of her criticism: she is particularlyscathing about the behaviour of the monied and the upper classes, fleeing selfishly and giving more care to their possessions than to fellow human beings. She also explores thoughtfully the situation of those in the occupied village and their behaviour; it’s very easy to condemn but do we really know how we would behave in a similar situation? By the time she was writing this work, Nemirovsky had lived a dramatic life: after a comfortable upbringing, fleeing the Russian Revolution and Civil War, she had settled in France and (she thought) become assimilated, often ignoring or denying her Jewish roots. However they, and the Nazis’ Final Solution, caught up with her and she was unable to survive the death camps. “Suite Francaise” is a remarkable work; an insider’s view of France during pivotal moments of WW2 and a breathtaking portrait of its people under extreme circumstances. Although the work was never finished, we are indeed lucky that at least this much survived. Without getting too much on my high horse, I had a look at the back of the new film tie-in edition and, guess what?? It’s completely different to my version, focusing on the love affair and nothing else. I rather think that this will be case, once more, when the book is definitely better…..